As you move the camera into your scene along the Z-axis, you may notice that the lines of your elements which were drawn with pencil lines instead of brush strokes appear too thick. There is a simple way to taper down the pencil line thickness while performing a camera zoom-in. 1. In the Timeline view, double-click on a drawing layer to bring up the Layer Properties panel. 3. 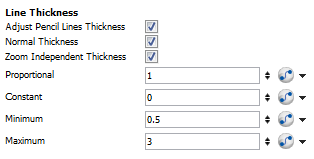 Under the Line Thickness section, adjust some of the following parameters until you achieve the desired effect. ‣ Adjust Pencil Lines Thickness: Checking this option allows for the adjustment of pencil lines thickness and activates the adjustable parameters in this section. ‣ Normal Thickness: This is the default option and when it is the only selection, negates the adjustable parameters and keeps the line thickness at their original proportions to the camera position. In general, it is good to keep this option checked. If you uncheck this option, all your pencil lines will disappear if you have nothing on the colour art layer. If you do have artwork on the colour art layer, your lines will be replaced by the colour art. ‣ Zoom Independent Thickness: Checking this option will keep all lines at their default thickness regardless of the camera zoom. This may create the illusion as the camera zooms-in that the lines become thinner, when in fact they have remained the same thickness. ‣ Proportional : This parameter is set to 1 by default. All pencil line thickness in the scene will be multiplied by the value entered in this field. For example, if the value entered is 2, then a pencil line thickness of 5.5 will become 11, while a pencil line thickness of 21.7 will become 43.4. ‣ Constant: This parameter is set to 0 by default. Changing the value is this field will multiply the line thickness by the pixel portion of the camera frame. ‣ Minimum: Enter a value into this field or use the arrows to set a minimum line thickness that cannot be exceeded. ‣ Maximum: Enter a value into this field or use the arrows to set a maximum line thickness that cannot be exceeded. This feature can only be viewed in the Camera view's render mode.